Walking into Valletta, one is borne upon the current of bustling suits, briefcases, shopping bags and cameras. The scenery: a river of faces avoiding glimpses of acquaintances keeping with the steady beat of rubber soles slapping the ground and the occasional clank of metal being assembled in the shape of modernity. Yet take a left turn around any indistinguishable corner and the landscape will carry you down a narrower path that leads to an ordered and predictable labyrinth of long, narrow, dark streets; a steep descent towards sea level with awkward pavements that resemble stairs, three or four stories of decay on either side, and the occasional refurbished building sticking out like a sore thumb. 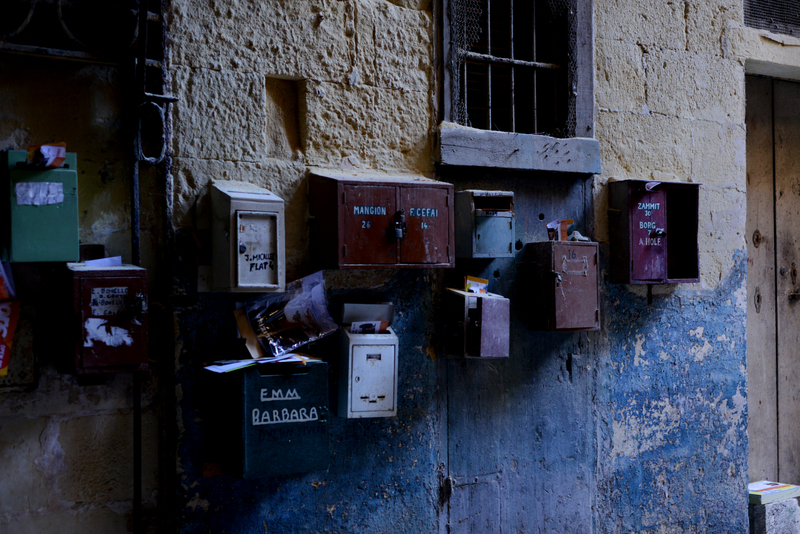 Rust, bent railings of balconies with no landing and the chipped-off pieces of walls belonging to abandoned buildings; Welcome to residential Valletta – the Valletta of Beltin. Whether you’re a tourist or Maltese, the feeling this Valletta permeates is identical - that you're an outsider; a non-Belti, and this grants you very skeptical and unsettling looks from elderly residents perching high up on their balconies, choosing to spend their time looking down at the uneventful streets. These are proud people who claim to be “Beltin first, and Maltese second”, and in Valletta, pride belongs to the poor and the elderly. This is the Valletta that received me – an undergrad asking awkward and uncomfortable questions. Walking around these streets I soon found myself in Piazza Mattia Preti; a forcibly modernised square that clashes heavily with two towering building blocks on either side – reminiscent of Mintoff’s lack of aesthetic interest. This modernised piazza is one example of the State’s initiatives to give this city a drastic facelift in light of the V18 events. The face of Valletta is an empty slate at first glance; to be painted on and given colour by the foreign power that acts as custodian. From the Knights’ gentlemen club to the British and US navies’ red light district (among other things), the city is now meant to be a symbol of Maltese-European identity. Republic Street, Hastings Gardens, the Triton Fountain and Market Street may be the areas that most people are familiar with – but this is only the straight face of a city that has been riddled by decay for some time. Bertu, a bar owner and one of my main informants from Mandraġġ, once told me, ‘il-Belt qed tispiċċa, u daqt nitilqu aħna wkoll’; a pessimistic sentiment that is shared by most Beltin. With population size having reached an all-time low in Valletta, and population decline being a historical trend since the British left and took the most readily available forms of employment in the city with them, the city has suffered. No longer being the economic hub of the island, Valletta has become a rusting monument of administration and fossilised local culture. With 25% of the population of Valletta falling within the 65+ age bracket, Valletta ranks as the second oldest urban centre on the island – second only to Floriana. This suggests that younger people have been leaving Valletta, the elderly have endured, and not many newcomers seem to be coming in to replace this hole in Valletta’s population. This population decline is the main culprit behind the multitude of empty property and their gradual decay in lower Valletta. Other Mediterranean cities, most notably “eternal” Rome, have been experiencing gentrification at an alarming rate. This is the displacement of class populations, where the middle class swoops in to rehabilitate an area of lower class housing into a middle class neighbourhood. In Rome, for example, businesses and middle class individuals with the capital to buy property in the city also have the power to evict the tenants once the property changes ownership and their lease is not renewed. Residents who have occupied their property for most of their lives suddenly find themselves being muscled out of the place they once called home due to their legal illiteracy and a lack of legal protection from the State. In lower Valletta, the situation is drastically different in many ways. Il-Mandraġġ, for example, mostly comprises social housing buildings that are owned by the government and renowned for low rents. These are properties that cannot be bought by the residents. The few people who are relocated to such buildings by the government are usually social cases like single mothers and individuals with financial difficulties and are by no means part of the middle class. In such an example, it would not be accurate to call this ‘gentrification’, as there is no displacement of one class by another but rather disadvantaged individuals that are part of the lower class moving into previously unoccupied flats. With the relocation of these people, these regions are becoming social dumps that continue to reproduce the region’s own shame and poverty. What was once a means to eradicate slums has now become a monument to poverty and social immobility. Apart from the social housing buildings, the majority of other buildings are privately owned and seem to be abandoned and disused, as landlords prefer to keep decent houses empty rather than rent them out cheaply. The idea is that if one eventually manages to reel in a wealthy tenant and his rent, it will compensate for the losses made by keeping it empty while waiting for the said potential tenant. This might also be due to the old rent laws that seemed to favour the tenant in that the lease could be inherited, making renting less desirable to the owner. 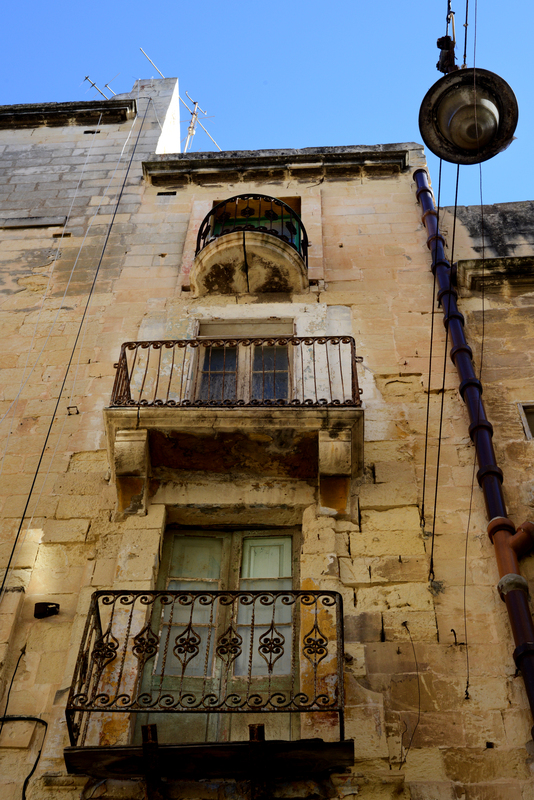 This inevitably results in the neglect of property; a very common sight in the residential areas of Valletta. 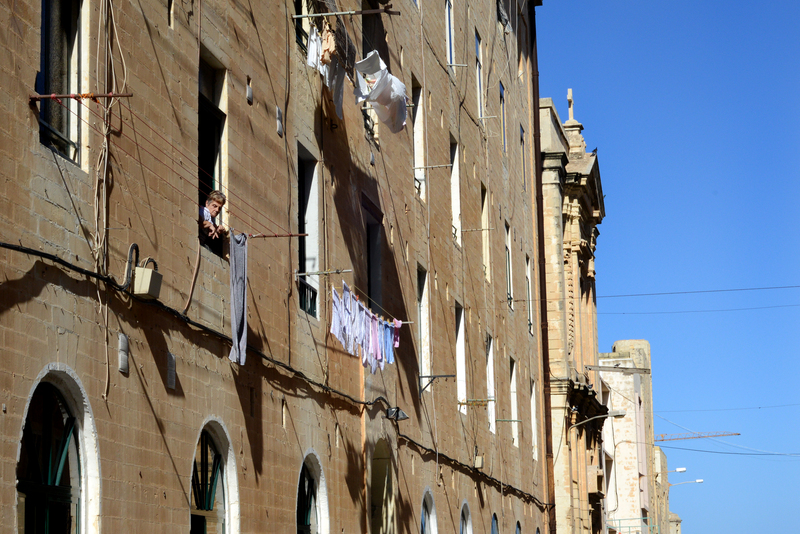 For this reason, gentrification in Valletta isn’t really an active or cynically strategic one: the lower classes aren’t being “pushed out” by the middle class…yet. Instead, the middle class, businesses, and prospective residents are being opportunistic by purchasing and renovating empty buildings which relieved landowners are very willing to sell to the right buyer, due to a new and budding demand for property in the city, in effect changing the urban landscape of these regions. It is at this point in its turbulent history that the spotlight has fallen on Valletta as the State prepares to re-evaluate its history, manufacture its present and set the foundations for an open-ended, incomplete urban fabric where gaping holes of disuse and decay are now advertised as opportunities for investment. The Knights of St. John have taken centre stage in the marketing of the city as the country’s main claim to both Catholic and European roots. The Knights also provide a powerful anti-Arabic element in the negotiation of Maltese identity as Malta is portrayed as the final frontier of European culture. No one should deny, therefore, that Valletta is indeed a European Capital of Culture. To put it simply, the State aims to endow the city with an attractive urban fabric in the hope that it proves enticing in the years to come. To a certain degree there seems to be an understanding that the State can only catalyse change within the limits of a fixed history. The “lure” of the city is something that people need to rediscover themselves through experiences, activities, events and investments. Perhaps nowhere else in Malta is an ideological struggle more visible. Appalled by the current drive to modernise, many older city residents still carp about the importance of their identity as Beltin, which they further consolidate through the very act of enduring Valletta. Beltin believe that the built urban environment should be preserved and restored rather than reconstructed and renovated. ‘How I wish there was a cemetery in Valletta, so that I can be buried here also’, a man called Vince once told me. With the word ‘here’, he lightly touched the wall of a house with the palm of his hands. For people like Vince, Valletta includes the buildings, architecture and stories of these places, as much as that of people. The old residents want Valletta to remain a monument that anchors itself in its own past, where their identity still carries some meaning. The State, on the other hand, is set on promoting present day art and culture as a means to breathe in new life in the city by encouraging artists, businesses and potential residents to invest their time, effort and money in the city as the historical and ever-evolving centre for European Arts and Culture. The effectiveness of this strategy has already started to yield results. With places like Strada Stretta being “rediscovered”, the renovation of various wine bars and restaurants, and the increase in demand for property, the State’s plans are turning out to be somewhat of a success. Valletta stumbles to get back on its own two feet as the urban fabric is rediscovered and refurbished from the inside, by and for the non-residents and non-Maltese alike. In terms of real estate, Valletta was not really considered viable until a few years ago. This, however, has started to change. With some local real estate agencies featuring a section in their website purely dedicated to property in Valletta, the stage is set for a real life drama. The State is simply the director yelling “Action!”. If, however, the State does not legally support the residents of Valletta in the coming years, the demand for property in the city could easily grow to the point where the empty property available won’t be enough to satiate the demand. The desire for property in Valletta will begin to spill out into occupied houses and flats as the price of property rapidly increases. The newly amended rent laws also limit the security of tenants as it is only the first generation descendants of post-war tenants who can automatically inherit the tenancy -after that the owner can choose not to renew it. Residents, most of whom rent their apartments, might find their place in their city threatened by people who have the power to buy the property from their landlord and even evict present tenants. On the one hand, gentrification seems to be the only cure for urban degradation, yet if kept unchecked, it might threaten to rob the current residents of their place. There is, of course, some resistance. But it is only the helpless and pessimistic narrative of nostalgia. Nostalgia that aids in recreating the attractiveness of the city for outsiders, while also fortifying the residents’ claims that “their Valletta” is as old and crippled as most of them are, and its only future is death and rebirth into something different; something foreign. Today I walk through Republic Street admiring clothes, gadgets, jewelry and busy men and women in suits chatting in cafes. Yet I also notice tourists slowly arching their necks at an awkward angle to discover statues, balconies and architecture untouched by time, as they wander; looking above the ground floor that mystifies the rest of us. I fear that one day I too will walk along the streets of a new Valletta looking for a hint of this city’s great past. But I will not find it in monuments and theatres. It will be staring down at me, from where it’s always been; looking down at swarms of men oblivious to its ancient presence.